Carita and Stuart Kadison began collecting Wedgwood in the late 1950’s but it was not until the mid 1960’s that their collecting really developed. Their early area of focus was Wedgwood and Bentley and the other fine wares of the 18th century. They traveled extensively, searching for new pieces, and also relied on dealers such as Seal Simon, Fred Tongue, Leo Kaplan and David Newbon. 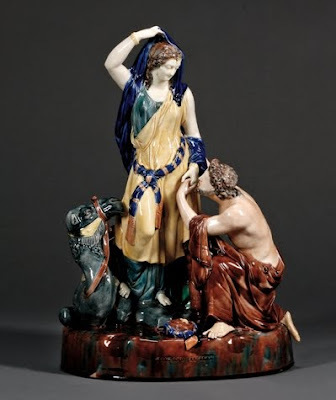 As time went by they also included Wedgwood majolica as a focal point, and they amassed one of the finest collections of Wedgwood majolica in the country. Much of the collection is illustrated in Robin Reilly’s two volume Wedgwood dictionary. This important sale includes two hundred and thirty two lots and features numerous examples of Wedgwood and Bentley, 18th century jasper including a pair of tea urns and covers, and a wide variety of black basalt with plaques, wine and water ewers, stirrup cups, busts, tea wares and other ornamental wares. Variegated wares, cane ware and queen’s ware are also well in evident. The majolica encompasses over seventy lots and includes many figures and figural groups featuring a large Isaac and Rebekah group, a hefty model of a bull, and many ornamental wares and tea wares. Also worth mentioning are a fine pair of moonlight luster crater urns, fairyland luster, Emile Lessore decorated wares, and a blue jasper mounted ormolu, wood and cut glass figural mantel clock. Preview: Thursday, September 30th, 12-8pm; Friday October 1st, 12-5:30pm. Sale: October 1st at 6pm. PLEASE VISIT THE SKINNER WEB SITE FOR A PHOTO TOUR! For further information please contact Stuart Slavid at sslavid@skinnerinc.com or at 508 970-3278.